(John) Joshua Kirby (1716-1774), Artist and teacher of linear perspective; friend of Thomas Gainsborough. Sitter in 7 portraits. Sarah Kirby (née Bull) (circa 1718-1775), Wife of John Joshua Kirby. Sitter in 1 portrait. Gainsborough got to know Kirby when the two men collaborated on a painting around 1748. 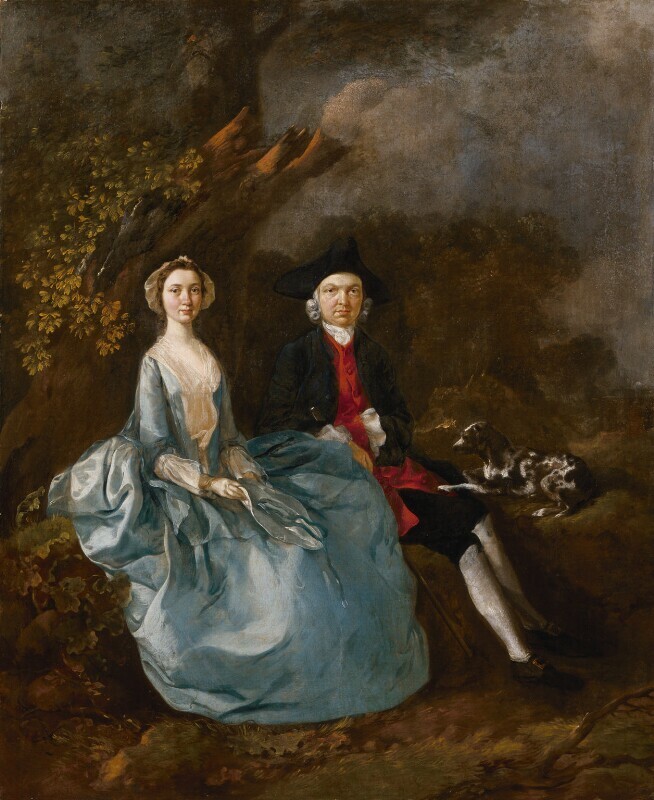 They became life-long friends and soon after Gainsborough painted this informal portrait of the couple and their dog. While the scene seems to be set in the English countryside - probably their native Suffolk - X-rays show that Gainsborough's original plan was grander and more French in style. The rustic landscape once included a classical sculpture which Gainsborough covered up with the tree-trunk. More detailed information on this portrait is available in a National Portrait Gallery collection catalogue, John Kerslake's Early Georgian Portraits (1977, out of print).